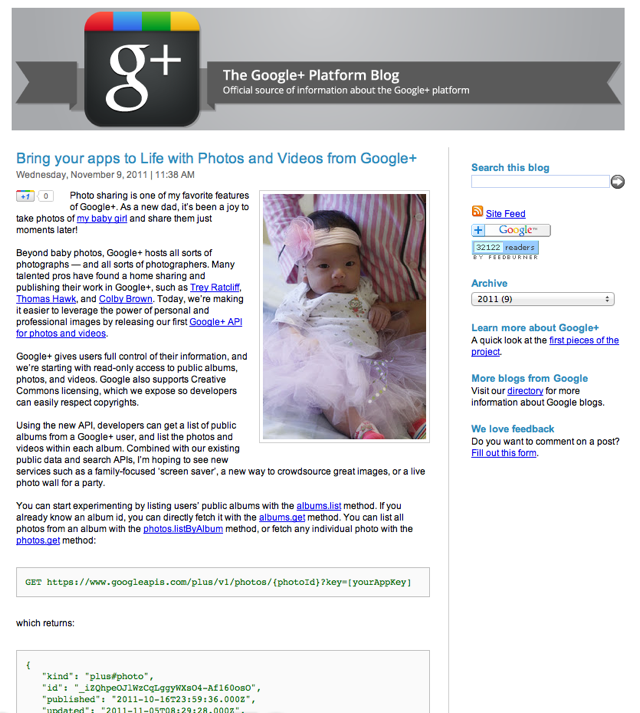 Based on official blog posts that were apparently posted early (and then pulled), developers will soon be able to access some key features of Google+ via the service’s API: photos and videos. Google announced the news on both the Google+ platform blog and its Photos blog, only to take the posts down shortly thereafter — but not before they were copied by Google’s cache, syndicated to Twitter, and spotted by TC reporter Robin Wauters. You can find a cached version of the blog post here, and I’ve included an image below. According to the pulled blog post, this initial API will only give developers read-access to users’ content — third-party apps will not be able to upload new photos and videos yet. But it’s still an important step — photos and video are crucial to any social network (Facebook is the world’s largest photo site by a huge margin, for example). Google+ gives users full control of their information, and we’re starting with read-only access to public albums, photos, and videos. Google also supports Creative Commons licensing, which we expose so developers can easily respect copyrights. Using the new API, developers can get a list of public albums from a Google+ user, and list the photos and videos within each album. Combined with our existing public data and search APIs, I’m hoping to see new services such as a family-focused ‘screen saver’, a new way to crowdsource great images, or a live photo wall for a party.